There is nothing more succulent than Phi Phi Island seafood served fresh with vegetable and rice. Since this Thai Island is largely inhabited by fisherman, you know your Phi Phi Island cuisine has come from an honest, hard day's work in the Bay. There are some top notch restaurants that specialize in serving this fresh Phi Phi Island seafood right to your table each night. One of the main providers of Phi Phi Island seafood is located in thePhi Phi Island Village Resort And Spa. This resort is a beachfront property that overlooks lush tropical gardens. Phi Phi Island cuisine is served at the Marlin Restaurant. Here, fresh fish is served daily as they have been critically acclaimed for their delicious Phi Phi Island cuisine. At Marlin restaurant, you can have your fresh seafood cooked any way you want in this beautiful, airy dining room. Another hotel in Phi Phi Don' s Tonsai Bay, where you can experience delicious Phi Phi Island cuisine, is the Phi Phi Island Cabana Hotel. The property is situated on over 11 acres that overlooks the bays of Ton Sai and Loh Dalum. Luxury is not the only accomplishment of this hotel. 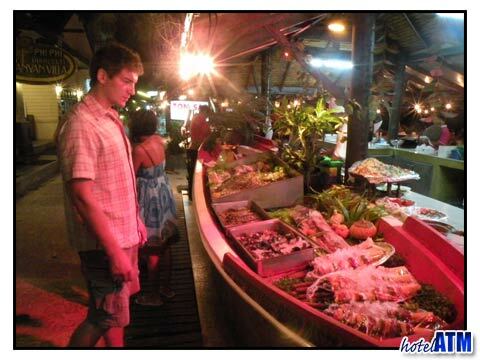 They also serve delicious fresh Phi Phi Island Seafood at the MayaTerrace. Here you can feast on Phi Phi Island seafood cuisine for lunch or dinner. The Holiday Inn Resort, located on Phi Phi Island, boasts as having some of the greatest Phi Phi Island seafood around the island. It is here, in the Cha-Bah Seafood Restaurant in which tourists can partake in a fresh seafood market. Some say it is an experience that one should never miss. You can dine on Phi Phi Island cuisine on the beach for lunch or for dinner from 10:00AM-10:30PM. Although this restaurant can seat up to 60 people, the atmosphere is quaint enough that it feels like home. You haven't tasted fresh fish until you have tasted fresh Phi Phi Island seafood. Imagine a hardworking fisherman working on a simple wooden boat in the hot sun. This is the same fisherman that will catch your Phi Phi Island cuisine. When you think of all the hard work and toil, Phi Phi Island seafood takes on a whole other meaning. When visiting Phi Phi Island, one should never pass up the opportunity to enjoy the famous Phi Phi Island cuisine and seafood.